"If all the systems collapsed and the supermarkets were empty what would you do? Would you come hunting? I know what Id be doing, Id be out there with my rifle hehe" Other redneck mate remarks "Id be out in me boat, plenty of fish out there, while all you idiots are shooting each other"
Now Im living in a more urban area I should get out and find a good wild food source incase I get that question again..
Nice forum archaeology there. How is the bag thing going Baldy? Any major catastrophes it has saved you from yet? [quote="Gelert"]Don't get too paranoid. Most people will never encounter such a situation or be dead by the opening credits, running around a city with an M4 is for the privileged few. Ditto. The few people left alive after a real apocalypse would face an unpleasant world they wouldn't want to live in, punctuated by a death in a most unpleasant manner. The best "bug off bag" would be a bottle of cyanide tablets or something else that would bring death painlessly, locked in a cabinet somewhere while you do your best to enjoy life before an apocalypse. [quote="fredrikw"]Nice forum archaeology there. How is the bag thing going Baldy? Any major catastrophes it has saved you from yet? I am still alive so it must be working, at the moment my gym bag is perfect BOB. Always stocked with protein shake, snacks, pain killers, plasters, waterbottle and a leatherman. Then the revolution happens, I will survive the first 24 hours. Having watched "The Walking Dead", I have a better idea of what a BOB really needs to contain. But that bag didn't really do them any good, did it? They got a LOT of use out of those guns. The really scary thing about that virus is that it takes both British people and people from New Jersey then gives them Georgian accents. [quote="beforewisdom"]They got a LOT of use out of those guns. Didn't they lose them when they needed them the most? But first and foremost, they managed to survive without them, so that heavy bag was defaulted as not needed. This bag needs to contain what you really need, not just what would be handy but you can do without. Based on 'Shaun of the Dead' a cricket bat is a REALLY good idea for that bag. [quote="fredrikw"][quote="beforewisdom"]They got a LOT of use out of those guns. Didn't they lose them when they needed them the most? 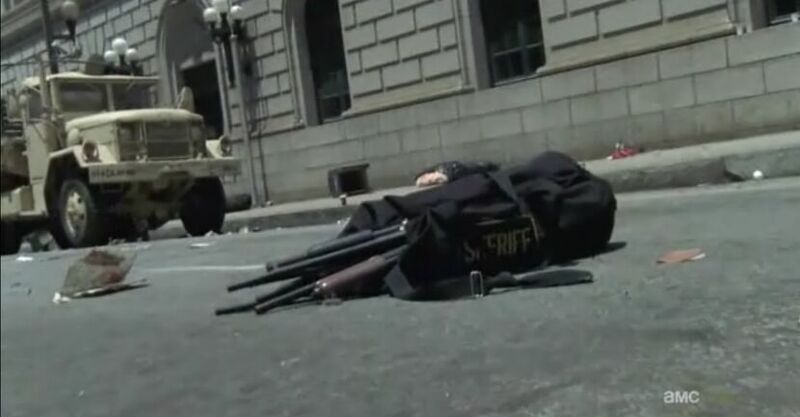 The protagonist, Rick, cleaned out the gun locker at his police station and filled that bag at the beginning of the series. He dropped the bag in Atlanta during an attack, before he met up with the other survivors. Those survivors were low on ammo and guns, before he went on a mission to Atlanta to retrieve the bag. Those guns are used almost every time they encounter walkers. I think the way to is with a cross bow like Daryl's and a fireman's axe for close quarters. Those things are reusable and don't make a loud noise like the guns, which attract more zombies. It is interesting how Daryl doesn't get infected pulling his arrows out of zombies. I guess you could always say he is careful cleaning the arrows off. Getting back to reality, a "bug out bag", might be useful in an evacuation ( not an apocalypse ) situation, like a global warming flood, a nuclear power plant accident, etc. I would vote for water, energy bars, tea, antibiotics, stimulants, a chemically powered flash light, basic hygiene stuff, a canteen of water and a book to get your mind off your troubles while you are huddled in a refugee center.